In the growing segment of the Internet of Things alone, six new testing laboratories were opened since 2016. In addition to network-enabled consumer goods, the focus is mainly on automotive components for networked driving and new services related to Industry 4.0. After good performance in 2016, DEKRA is well on course to fulfill its strategic vision to become the global partner for a safe world by 2025. DEKRA has responded to the further development of mobility and the associated area of motor vehicle connectivity by expanding its international testing network for the Internet of Vehicles (IoV). In Asia alone, five new labs were opened in 2016. In January 2017, another one was opened in Hsinchu (Taiwan). “As the largest laboratory to date for networked and electronic driving, Hsinchu plays a key part in expanding our role on the automotive testing market,” explained Stefan Kölbl. There, for example, automotive suppliers and spare parts manufacturers can have the connectivity and electromagnetic compatibility of their products tested and certified. DEKRA Automotive continued to make a significant contribution to the DEKRA Group’s success in fiscal 2016. Revenues climbed by 5.8% to EUR 1.5 billion. In addition, almost EUR 150 million were generated from periodic industrial testing services in Germany carried out by DEKRA Automobil GmbH. DEKRA Automobil GmbH in Germany also saw an increase. Its revenues grew in total by 3.5% to EUR 1.1 billion. This reflects success in the core business of vehicle inspections and expert appraisals. For instance, it has consolidated its position as the market leader in testing with eleven million inspections and a market share of around 34%. Furthermore, the market position for recurring industrial testing services in Germany was expanded further. For example, the market share in elevator testing business is now more than 10%. Internationally, DEKRA Automotive has also set the course for further growth. The number of inspections developed positively in fiscal 2016 following the establishment and expansion of the testing center network in Bulgaria, Canada, Sweden, and the US. As a result, DEKRA consolidated its position as a world market leader with around 26 million vehicle inspections per year. It also tapped into other markets such as Portugal and Luxembourg. In the context of digitization, DEKRA also pushed “Road Safety 4.0” in fiscal 2016. “In view of the rapid advancement of electronic assistance systems and the vision of automated driving, vehicle monitoring has to keep on developing as well,” said Stefan Kölbl. DEKRA is therefore calling for binding rules to allow manufacturers access to vehicle data relevant to safety. “Testing organizations always have to be informed about the current status of software updates. This is because software updates can be used by car manufacturers to change systems that are relevant to safety,” explained DEKRA’s CEO. “As an independent third party, we want to help prevent digital ‘Wild West’ scenarios in road traffic. In order to reduce particulate matter pollution, DEKRA also launched a large-scale trial in March 2017 together with the city of Stuttgart and street cleaning specialists. Regular and intensive street cleaning is intended to remove a large portion of the coarser particles. Only 6% of particulate matter comes from exhaust emissions, but 31% is caused by tire and brake abrasion as well as particulate matter being churned up. DEKRA is supporting the trial by performing comprehensive measurements and laboratory analyses. In fiscal 2016, DEKRA Industrial achieved revenue growth of 5.6% to EUR 851 million. “In a highly technological and increasingly digital world, we are successful as an independent testing organization because we test according to recognized methods and standards, thereby ensuring safety,” said Stefan Kölbl. DEKRA’s high acceptance in the digital environment is highlighted by several new accreditations in the product testing and certification service unit. Moving ahead, DEKRA will be providing test services for the mobile communication standard LTE-U on behalf of the Wi-Fi Alliance so that Wi-Fi and LTE-U can be used side by side without interference. In North America, DEKRA was also named as the telecommunications certification body and the first accredited test laboratory in North America by the LoRa Alliance. The Material Testing & Inspection service unit has again benefited from the broad range of its expertise, for example in non-destructive testing and robot-assisted inspection. The service unit has won several major orders from companies in the energy industry in Sweden, Switzerland, and South Africa. In addition, China also saw the successful launch of business with visual inspection services in nuclear power plants. In the Business Assurance and Insight service units, fiscal 2016 was also defined by entering new markets. Following the strategic acquisition of AQS Management Systems Inc., Minnesota, DEKRA is the leading provider of training for auditors and quality management experts in the US. DEKRA Insight acquired key new customers in the consulting business. For instance, two global players in the food industry placed major orders to improve organizational and process safety. In the first months of fiscal 2017, DEKRA further expanded its global presence and international business. In April, VEIKI-VNL, a large test laboratory based in Budapest, was acquired. Its 60 employees have their own labs and are testing specialists in the area of energy supply and distribution, with customers in over 40 countries. “With VEIKI-VNL, we are further expanding our testing and certification services on the power and energy market,” as DEKRA’s CEO Kölbl explained the acquisition. The Industrial & Construction Inspection service unit showed encouraging sales growth, especially in France, DEKRA’s second home market. 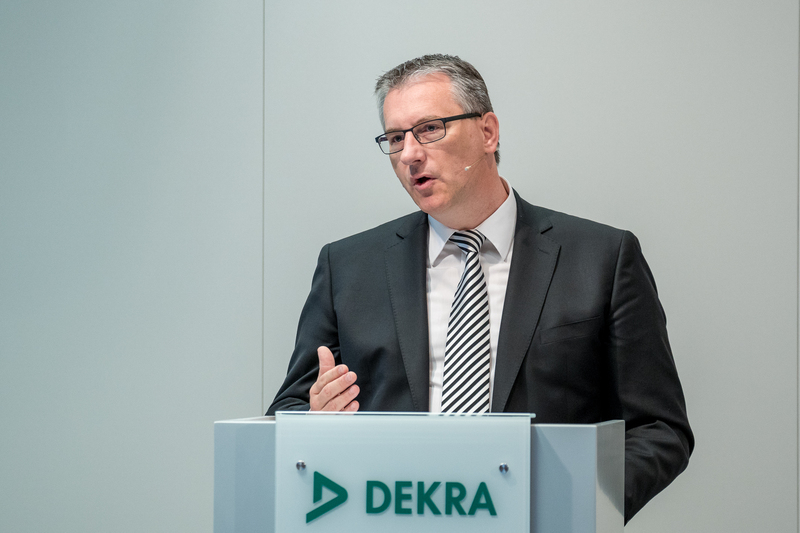 Thanks to the encouraging business performance at DEKRA Akademie and DEKRA Arbeit, DEKRA Personnel increased its revenues by 11.5% to EUR 521 million in 2016. As one of the largest private training providers in Germany with over 170,000 participants last year, DEKRA Akademie was successful, inter alia, in the corporate client business with qualifications in the area of occupational and fire safety. Revenues from fire safety training alone rose by around a third. DEKRA Akademie was also successful here thanks to its early commitment to language training and integration services for refugees. On the growth market of online qualifications, DEKRA Akademie has added more subjects to the DEKRA Safety Web. In addition, it developed additional blended learning courses, i.e. combined teaching with virtual lessons and face-to-face training, for security officers, inter alia. The Expert Migration program continues to be very popular: Around 1,500 carers from Eastern Europe are getting their qualifications to work at German clinics and care homes. After successfully completing the program, they are also offered a permanent job. This successful program is to be extended to the area of IT with specialists from Albania. DEKRA Arbeit has maintained its position as the seventh largest temporary staffing and HR service company in Germany and further expanded its business. In the business with major customers, for example, the framework agreement with a car manufacturer was extended until 2020, and the portfolio was expanded with services including interim management and HR consulting.